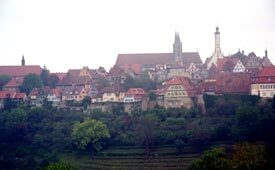 ABOVE: The skyline of Rothenburg ob der Tauber on a misty autumn day. The former Free Imperial City of Rothenburg ob der Tauber is the star attraction along Germany's Romantic Road. It's justifiably celebrated not only for its well-preserved medieval buildings and walls, but also for its unspoiled setting. When you approach the city or stand atop its walls and gaze out over a countryside that's free of suburban sprawl, it's easy to imagine what Rothenburg must have looked like in the Middle Ages. Skeptics might complain that Rothenburg feels like a theme park, but that says more about theme parks than it does about Rothenburg. This Franconian gem is the real deal: a working town of 12,000 people where heritage, historic preservation, and modern life have achieved a profitable equilibrium.